Life. It does things to ya sometimes, eh? Like I was all “not me” and didn’t get the shingles vaccine. Guess what I got for Christmas? Big hugs and hope things go better for you soon! Glad to hear there is a new treatment. Sending hugs for a good result. Hoping the new meds make the return of your lymphoma a minor blip in your life! 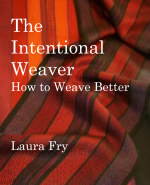 You can't stop weaving, or sharing your talents with all of us! Laura, I so hope that you will be able to recover. Thinking of you.